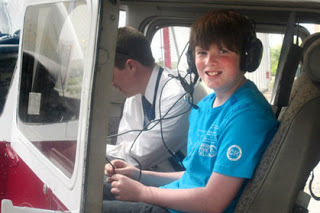 Rory Staunton taking his first flying lesson in 2011. Last Saturday I should have been at my sister and brother-in-law’s in Sunnyside, Queens, trimming their tree with my daughter Alana and wife Debbie. Their kids Rory and Kathleen should have been there. Rory, as always, the more serious older one, watching the two other scamps as they dressed up and performed silly sketches. Instead, he would definitely have been engaging me in some discussion about a world trouble spot. The shooting in Connecticut would have been on his mind. He hated to see injustice or people hurt. Rory was like that; a very savvy kid, described by his teacher as the most profound 12-year-old he had ever met. After the trimming we would then have settled down to our dinner, all the food you could eat, usually topped with an Irish Christmas trifle. Except all of that didn’t happen and will never happen again. Rory passed in April after doctors at NYU Langone Hospital missed vital signs that he was contracting sepsis from a simple cut. Rory now lies in a lonely graveyard in Co. Louth with my parents. The awareness of untimely death is everywhere this week. It is writ large on the beautiful and innocent faces of those destroyed by the madman in Connecticut, on the faces of the grieving parents and the shocked public grappling with an evil reality. I don’t know how the parents will cope. I read they stood around for hours hoping against hope in the local firehouse until Connecticut Governor Dan Malloy told them their kids had not survived. I know something of what they felt. We too waited desperately for good news, or any news about Rory as he lay in the ICU. Like the Connecticut parents, no one in authority came and told us. The onset of Rory’s passing was never first communicated by the doctors. Rather it was the sudden presence of the social workers and counselors flitting into the hospital waiting room as we waited desperately for word. I saw them, heard their comforting murmurs and knew we were in the shadow of death. Despair opened that has remained when I think of those dreadful hours. In James Joyce’s classic short story “The Dead”, the title character Gabriel sees that same shadow flicker on the faces of his two elderly aunts as he carves the Christmas dinner and he realizes how silly and trite so much of his life has been. He thinks of the dead who have gone before him, he sees the snow falling softly, and he realizes even though they are gone, the dead are still with us in so many ways in our every waking thought, in our actions and our deeds. There is not a day goes by I don’t think of or talk to my nephew Rory. I know that is true of all who knew him and loved him. I think of those grieving parents in Connecticut and know it will be the same for them too. The dead are indeed with us, and when we commence that final journey westward as Joyce called it, they will be waiting for us too, of that I am certain. As Joyce wrote: “A few light taps upon the pane made him turn to the window. It had begun to snow again. He watched sleepily the flakes, silver and dark, falling obliquely against the lamplight. The time had come for him to set out on his journey westward. "Yes, the newspapers were right: snow was general all over Ireland. It was falling on every part of the dark central plain, on the treeless hills, on the Bog of Allen and, farther westward, softly falling into the dark mutinous Shannon waves. "It was falling, too, upon every part of the lonely churchyard on the hill where Michael Furey lay buried. It lay thickly drifted on the crooked crosses and headstones, on the spears of the little gate, on the barren thorns.